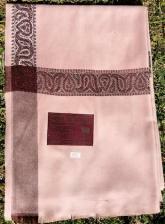 An assortment of fine quality wool shawls in shades of brown. 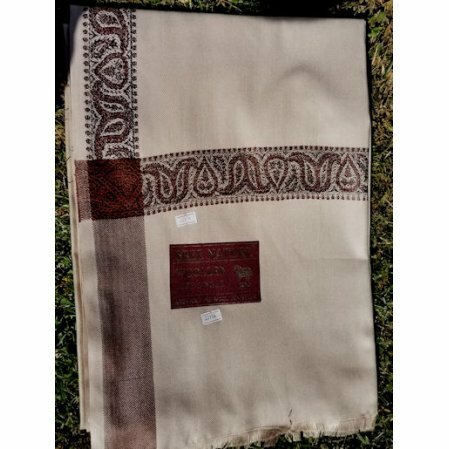 Fine quality wool shawls, all variations of light brown. Yeah, they're almost alike in the pictures. 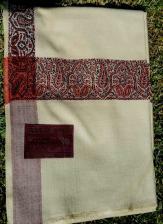 The shawls are approximately 50 inches x 100 inches (8 feet x 4 feet) suitable to cover the body while meditating. You can see from the dimensions that the shawls are plenty large. Limited stock of the different colors. Give in final comments an alternate color choice.. When it comes to purchasing quality items, I trust Vedanta. The natural wool shawls very good quality. After spending time using this shawl every day for meditation, it has become an indispensable companion. I appreciate the quality of the materials, consistent construction of the pattern, and the warmth it provides in the cold mornings. It is surely large enough to cover any size of person I think. Nice shawl fine on a cooler Southern California morning. The color is a soft orange and has no brown overtones. The embroidery is nice and understated. The material seems to have a slight sheen so I doubt it's all wool. In the end a nice shawl but don't depend on it to keep you warm, it does do me fine. I would recommend it yes.